Are you looking for a unique U.S. vacation that isn’t the same old, same old? 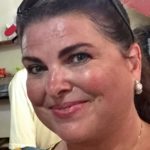 Our Southern TravelingMom was stuck in that rut until she headed across the entire country for a different kind of vacation in the state of Michigan. Wait until you see the one-of-a-kind things to do in Northern Michigan that she shares to replicate on your family travels. Some places were only reachable by boat! The Northern Michigan scenery ranks right up there with the best in the country. Photo by Melody Pittman/Southern TravelingMom. If you are searching for a unique vacation destination, look no further than Northern Michigan. I think vacationing in Michigan may be the best-kept secret in the country. I was really impressed with Michigan’s exquisite towns of Mackinac Island, Traverse City, Charlevoix, and Petoskey. Each destination was bursting with charm and character; reminded me of being in Europe. Here are the 10 best things to do in Northern Michigan. I don’t really think we need a reason to eat fudge because who would turn it down anytime, right? But since Mackinac Island is the fudge capital of the world, you should definitely indulge. Families gather in droves in the downtown fudge shops to watch master candy makers pour and flip the rich goodness to perfection in these heavenly smelling stores. Ryba’s Fudge Shops satisfied my sweet tooth with its Chocolate Mint fudge and English Toffee flavors of fudge. 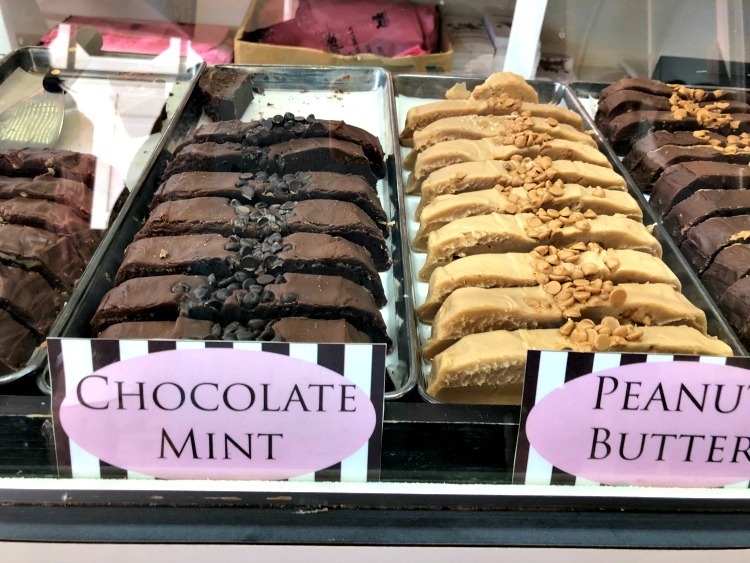 Decadent slices of fudge from Ryba’s on Mackinac Island. Photo by Melody Pittman/Southern TravelingMom. I never imagined that I would enjoy combing the beaches for rocks on my vacation but in Petoskey, it is a very cool thing to do. The stones are native to this area in Northern Michigan. Petoskey stones are both a rock and fossil and are quite beautiful when polished. The rock is shaped like a pebble and has ringed designs that look fashionable to me. With Michigan’s crystal clear water, it was easy to find them in the shallow waters. The rocks make nice souvenirs, too. If you can’t find them on your own, never fear; Petoskey stones are sold around town. 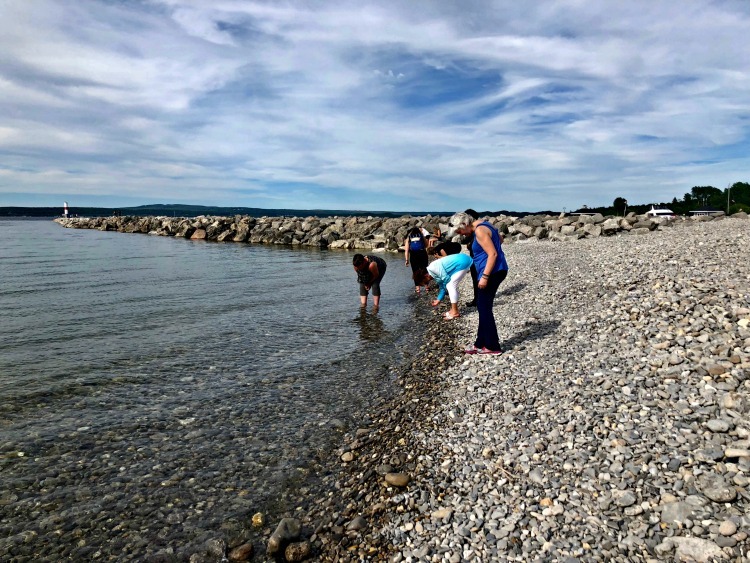 Here we are combing the rocky beaches for collectible Petoskey stones. Photo by Melody Pittman/Southern TravelingMom. Leland’s commercial fishing heritage is alive and well in “Fishtown.” This restored area offers quaint shops, 19th-century weathered fishing shanties, and scenic waterfront views. I enjoyed browsing the shops (especially Leland Gal) and eating a famous Third Coast sandwich (Chicken breast, Maytag blue cheese, lettuce, tomato, and Brownwood’s Kream mustard on pretzel bread) from Village Cheese Shanty. You can also charter a fishing boat in Fishtown, which would be a blast on the beautiful waters. I’m a facts girl, so it was interesting to learn that Fishtown was named to the National Register of Historic Places in 1975. Fishtown’s adorable shanties were an unexpected treat in Northern Michigan. Photo by Melody Pittman/Southern TravelingMom. Charlevoix (pronounced char-la-voy) is a beautiful town in Northern Michigan. It is surrounded by four bodies of water: Lakes Michigan, Round, and Charlevoix, plus the Pine River. With so much waterfront property, it would be a shame to miss taking a boat ride across the picturesque landscape and admiring the elegant homes. These killer houses often have two, four, or six incredibly fancy boathouses and slips, which made me feel a bit dreamy just seeing them. 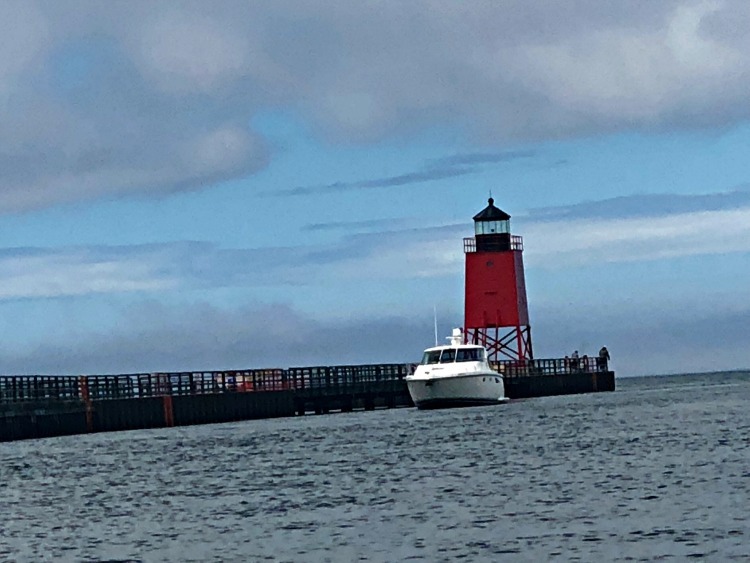 Make sure to schedule time for a quick trip to see the Charlevoix South Pier Light Station. One of the best things to do in Northern Michigan has to be spending as much time on the cool waters as possible. The prettiest view from our boat ride in Charlevoix. Photo by Melody Pittman/Southern TravelingMom. 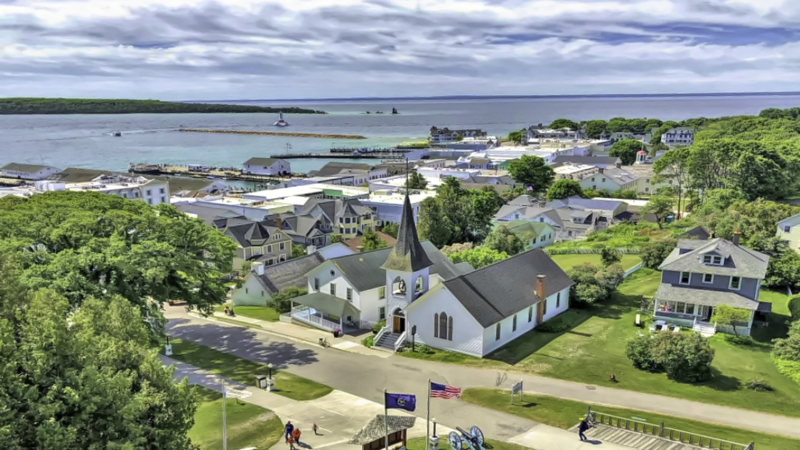 To get to Mackinac Island, you must travel by boat. We arrived by ferry. Once the ferry drops you off, you have three choices to get around: bicycle, on foot, or by horse-drawn carriage. While I don’t typically use horses for travel purposes, I did so on the island as it is the way things have been done for years and years. I actually found it quite nice to explore the Mackinac Island this way. The scenic trip was perfect for snapping pictures and seeing the pristine cottages and buildings. The horses were well-tended to and had plenty of rest time and water breaks. For those curious, there are 550 horses on the island. 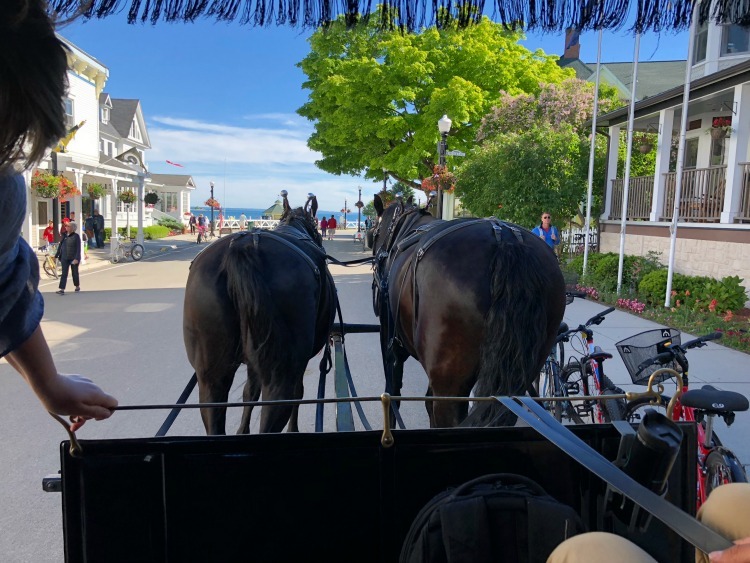 Getting around by horse and buggy is the popular way to see Mackinac Island. Photo by Melody Pittman/Southern TravelingMom. If you are an outdoor lover like myself, you probably enjoy visiting a new National Park on your travels. I’m all about getting a stamp in my National Park System (NPS) passport as well as adding a new park to my travels. Sleeping Bear Dunes is actually a National Lakeshore, not traditional park, encompassing 35-miles of shoreline. Towering sand dunes provide not only a treat for your eyes but also a playground for those physically fit enough to enjoy the four hundred fifty foot drop in terrain. I watched in awe as families ran down the dunes, then basically crawled back up, mostly on all fours. Signs were posted saying that it is possible you may have to be airlifted from the bottom due to the incline and strength needed to climb in the deep sands. 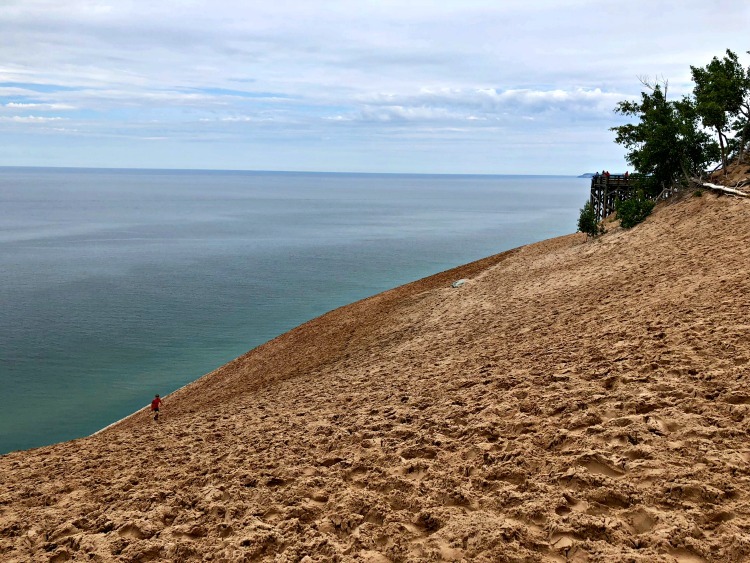 It can possibly take two hours to climb up from the bottom of Sleeping Bear Dunes. Photo by Melody Pittman/Southern TravelingMom. Michigan is also the cherry capital of the world. 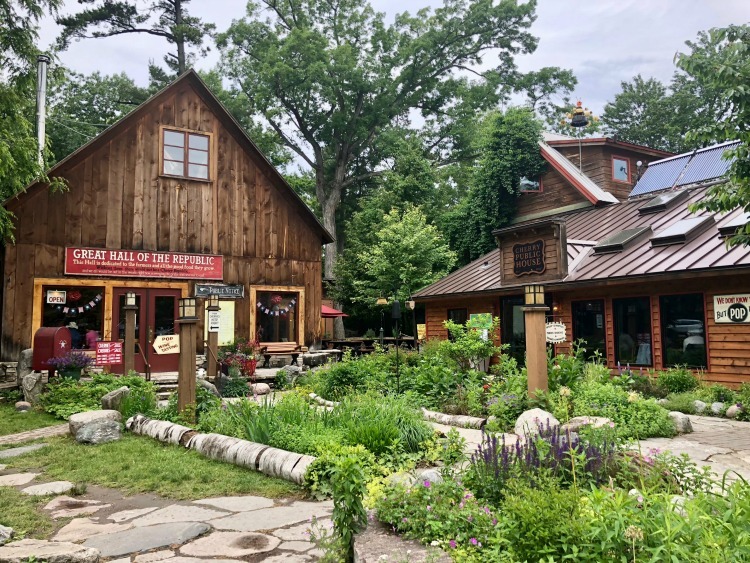 Find anything and everything you could ever want cherry flavored in the Great Hall at the Cherry Republic in Glen Arbor, a huge store dedicated to cherry salsas, syrups, jams, chocolates, and more! The Winery, directly beside the Great Hall, offers cherry wine tasting while The Grand Cafe offers a tasty meal, snack, or ice cream. Chances are you will not leave the Cherry Republic without purchasing at least one jar of the delicious classic cherry salsa. The cherry products are so delicious at Cherry Republic, that I’ve just ordered $100 worth of them to be delivered to my house. Photo by Melody Pittman/Southern TravelingMom. 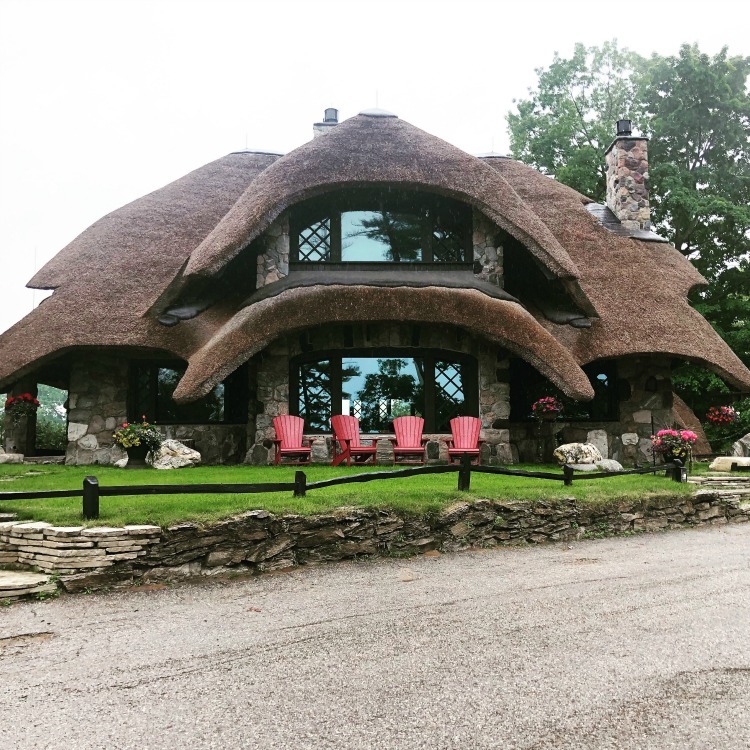 Local resident Earl Young’s quirky Mushroom Houses can be toured on your own or through a more in-depth tour aboard a cute GEM car through the town of Charlevoix. See for yourself these 26 adorable gnome-like homes, with stonemasonry walls and wavy eaves, designed by an eccentric man who was not a licensed architect. The melted look on the chimneys of the hobbit houses was my favorite part. Wouldn’t it be cool to see inside them? Unfortunately, they are all rental properties so that isn’t currently an option without renting one of them. Ssshhh…don’t tell…but visiting the Mushroom Houses was my favorite part of visiting Northern Michigan. Photo by Melody Pittman/Southern TravelingMom. Who isn’t a fan of wine sampling, especially when the wines are all lip-smacking good? On a tour of Mari Vineyards in Traverse City, you’ll enjoy the exquisite landscape and scenery almost as much as the tantalizing wines. I recommend the Praefectus red and the Scriptorium Riesling white. Mari Vineyards has one of the most upscale and beautiful tasting rooms I’ve ever experienced. The vineyards staff was super knowledgeable about the grapes, climate, and vintages. 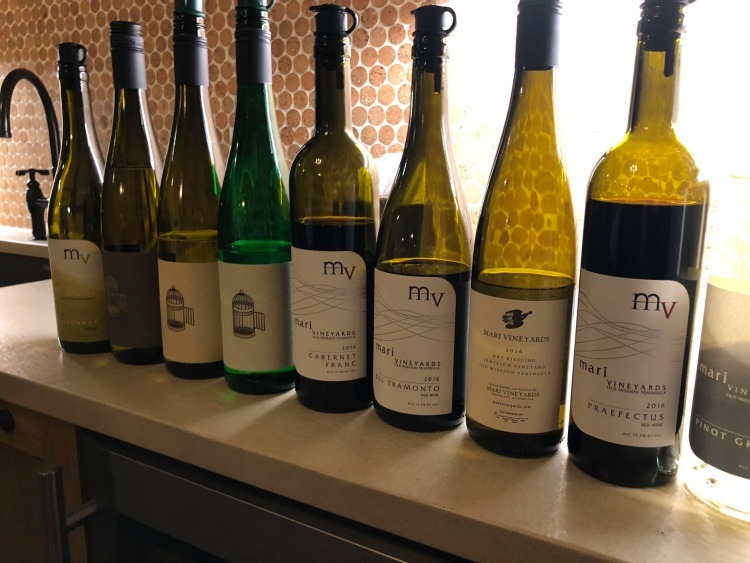 The taste of Mari Vineyards specialty wines is spectacular! Photo by Melody Pittman/Southern TravelingMom. I had read about Patisserie Amie in Traverse City long before I visited. Neither ain nor lack of motor transportation (ride shares are rare in this part of the state) did not stop me from trying Sunday brunch at this talked about French bistro. I opted for a Raspberry French Soda that whet my whistle and one of my favorite sandwiches ever, Croque Madame, to eat. Wow, the bechamel was on point, creamy and rich. I loved the open-faced concept of the sandwich and the taste was sheer perfection. 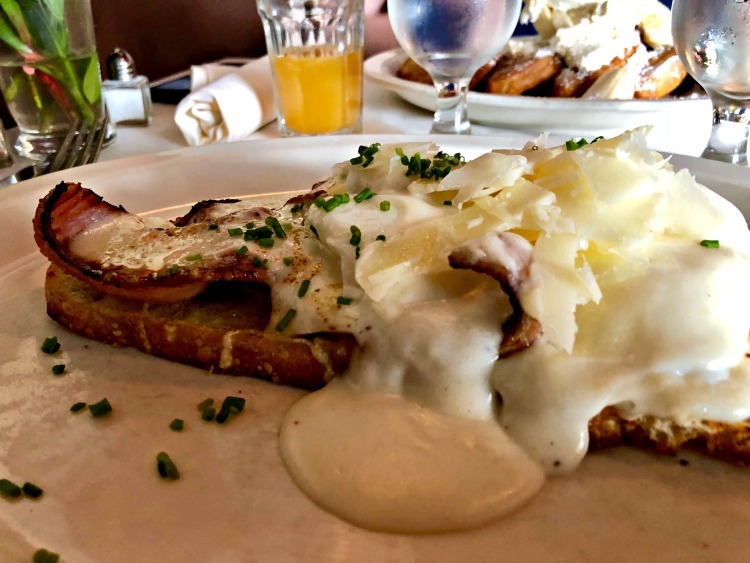 My Croque Madame was oozing with tangy, rich cheese and béchamel sauce making the bread soft and billowy. Photo by Melody Pittman/Southern TravelingMom. 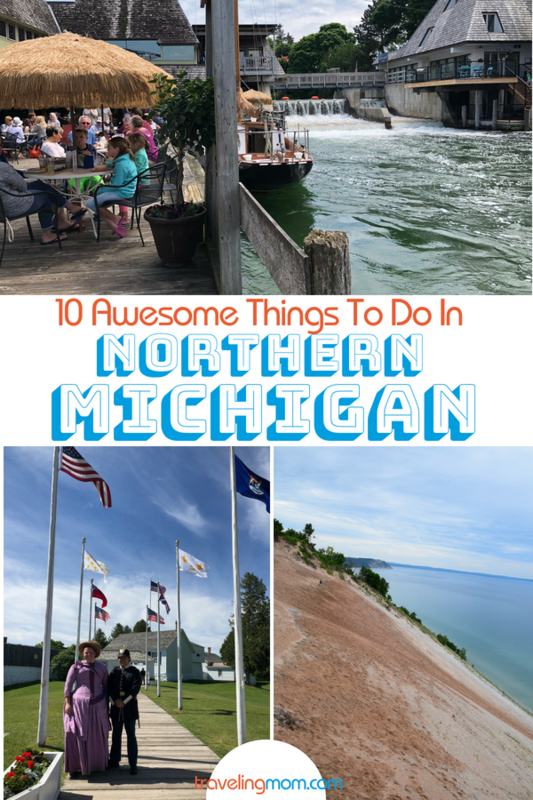 I am still in awe over the many cool things to do in Northern Michigan. Visiting this part of the state gave me several new experiences to write about and share with you. It is definitely a place I want to return and bring my whole family. If you haven’t been properly introduced to Northern Michigan, you may want to start planning right away! Should I Take a Baby to Disney World? Thank you for enjoying our great region! It’s incredible and so hard to take it all in. 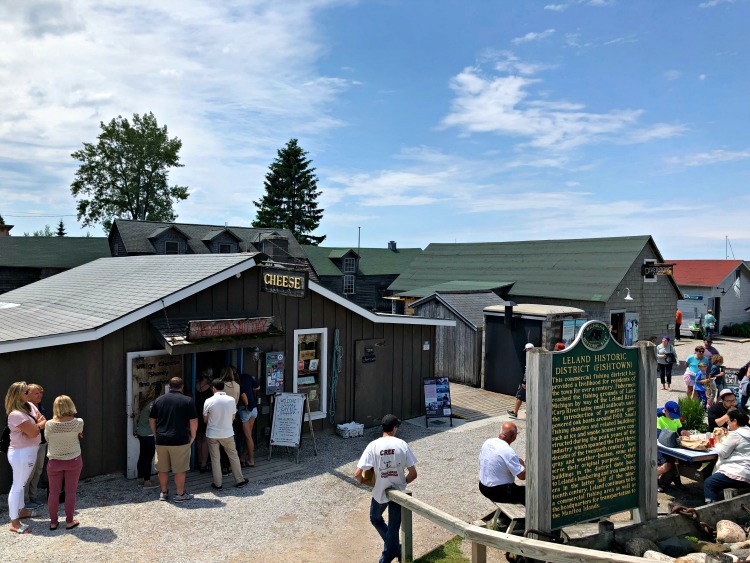 With nearly 50 wineries, 2 dozen microbreweries, incredible boutique towns with great shops, art galleries, parks, over 20 large and crystal clear teal inland lakes, the region is heaven on earth. Thank you again! I really want to see Mackinac Island. I mean really, really, really want to!! I know this will sound super sappy, but ever since I saw Somewhere in Time about 30 years ago, I have always wanted to see the island and hotel in person. You do have a great list here. I’m sure all the other things to do are wonderful, but Mackinac is on my bucket list for sure!